Dateline May 2015: ISIS almost took the northern Syrian city of Kobani. Then Kurdish troops forced them out. Now the Kurdish troops have left Kobani. Since there is very little resistance there ISIS is headed back to Kobani! Dateline November 2014: For the last few weeks the Al-Qaeda terrorist group called ISIS has fought for control over the city of Kobani, Syria. Reports say that Kobani is now very close to falling. ISIS already controls several towns in northern Syria as well as in northern Iraq but the takeover of Kobani is different. Up until now the towns and villages that ISIS has been able to take a foothold in have contained residents that are sympathetic to the ISIS cause. ISIS fighters are Sunni Muslims. So far ISIS has infiltrated towns that have large Sunni populations. In these towns the citizens have given ISIS refuge and support. Not so in Kobani. While a few Sunni Muslims in Kobani have lent their support to ISIS; Kobani has a majority Kurdish population. The Kurds completely reject Al-Qaeda’s threatened takeover. 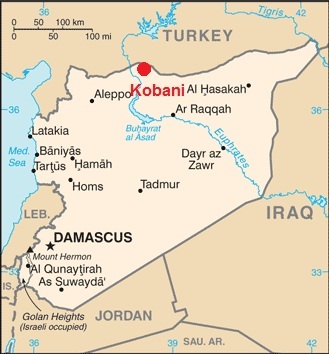 Kobani is on the northern Syria border with Turkey. Before the fighting began Kobani had a population of around 50,000 people. The vast majority of Kobani’s Kurdish residents have fled into the Kurdish inhabited areas of Turkey. As a matter of fact some 180,000 Kurds from around Kobani have fled into Turkey. Only a few hundred residents remain in the city. They have been joined by Kurdish troops. Together they are defending Kobani against ISIS but they are gradually losing the battle. Why am I telling you this? The prophet Nahum predicted the flooding and subsequent plundering of the ancient city of Nineveh. Nineveh fell according to Nahum’s prophecy in 612 BC. Today the city of Mosul in northern Iraq is built around the site of ancient Nineveh. Mosul is the hometown of ISIS. I think that Nahum’s prophecy also applies to the modern day city of Mosul. Nineveh was the capital city of the ancient Assyrians. Before the destruction of Nineveh the Assyrians had conquered the northern Egyptian city of No-Amon. The Assyrian King named Assur-banipal had conquered the city of No-Amon (or Thebes) in Upper Egypt in 663 B.C. The Assyrians may have been celebrating the fall of No-Amon when the flood hit Nineveh. In the book of Nahum God reminds the Assyrians that if it was possible for the city of No-Amon to fall then Nineveh was just as vulnerable to its own fall. In the book of Nahum No-Amon is simply called No in the English King James Bible. Nahum 3:8-9 Art thou better than populous No, that was situate among the rivers, that had the waters round about it, whose rampart was the sea, and her wall was from the sea? 9 Ethiopia and Egypt were her strength, and it was infinite; Put and Lubim were thy helpers. In the verse below, Nahum describes the Assyrians gathered together in a thick crowd when the flood hits. They are drunk celebrating their prior victories. It may be that ISIS will be gathered together in Mosul celebrating their conquest of Kobani when God floods Mosul. I am only making a comparison between ancient history and modern events. It seems to me that Nahum’s predictions apply to both. Where ISIS is concerned Nahum’s prophecy would seem incomplete without a previously conquered city. Of course I may be all wet here but not as wet as ISIS will be if the Mosul dam breaks! ISIS is represented by the ancient Assyrians in the Bible. Read all about them in my book The End of ISIS is near!